US recoups to beat China record in world's fastest supercomputer but how long? A new US supercomputer called Summit is now the world's fastest machine ejecting China's Sunway TaihuLight which has been titleholder since the last five years but how long remains the major challenge. The US has reclaimed the title to have the fastest supercomputer in history after five consecutive years of China's lead. But the rivals are secretly working on better systems that the new record may not last longer. 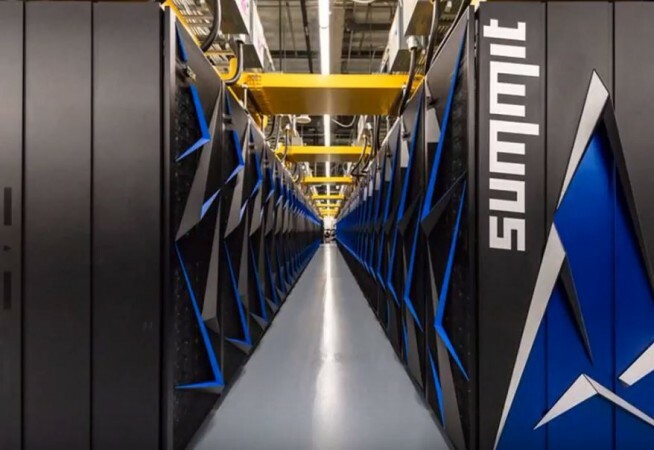 Summit, a machine built for the Oak Ridge National Laboratory in Tennessee, can do calculations at 200 petaflops, which is almost twice as the current title holder's. In computing, FLOPS ( floating-point operations per second) translates to how many calculations machines can perform with enormous or infinitesimally small numbers in one second. Collectively, the Summit supercomputer weighs almost 310,000 kilograms in total whose units are sheltered in an 860 square-meter room. Behind Summit's power are 27,648 GPUs from Nvidia and 9,216 CPUs from IBM stitched together with 185 miles of fiber-optic cable. It takes more than 15,000 liters to cool down the supercomputer and a massive electricity consumption equivalent to 8,100 American homes to power it up. It took the US government $200 million dollars for the Summit supercomputer to come to life, from the research and development up to the construction of the machine itself. Among other things, this type of computer can hugely help to solve major setbacks in industries like science, health, finance, national security, and the way corporations handle enormous amounts of data. From climate trend predictions to nuclear test simulations to big data and artificial intelligence, Summit and its counterparts are potentially the foolproof solutions to an uncertain future. Although Summit has not yet officially been named as the world's fastest supercomputer, Top500.org's Jack Dongarra, a computer scientist at the University of Tennessee, is positive that Oak Ridge National Laboratory's supercomputer has it in the bag. The list is expected to be revealed later in the month. The last Top 500 list was published in November wherein Sunway TaihuLight, which was built for China's National Supercomputing Center in Wuxi, holds the title and is followed by MilkyWay-2, which was built for China's National Super Computer Center in Guangzhou. Despite passing the record onto the US, China remains to be the home of most supercomputers ever built. And the question now is, will the Summit supercomputer be able to live on in its position? The answer is up in the air at this point as it's a toss-up between superpowers, like Japan, China, Switzerland, and the US, who have invested huge sums in pushing the limits of supercomputers of today. There is no doubt why these countries are spending millions of dollars to build supercomputers given its promising contribution to the speedy development of technologies in the grand scheme of things.